Komla Dumor was a highly acclaimed journalist who presented Focus on Africa on BBC World News, as well as being one of the lead presenters for World News’ European morning segment. To the great shock and sadness of the BBC and its audience around the world, Komla died suddenly in January 2014. He is much missed. 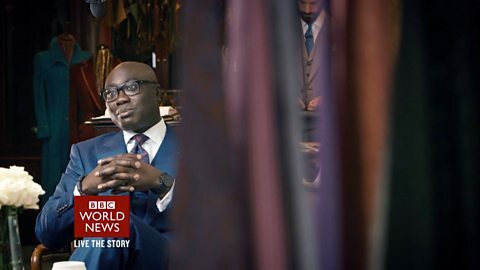 Komla Dumor was the presenter of Focus on Africa, the BBC's first-ever dedicated daily TV news programme in English for African audiences, broadcast on BBC World News. Komla was also one of the lead presenters for BBC World News' European morning segment. Komla joined the BBC in 2007 after a decade of broadcast journalism in his native Ghana where he won the Ghana Journalist of the Year award. Between 2007 and 2009 he hosted Network Africa for BBC World Service, before joining The World Today programme. In 2009 Komla became the first host of the African business news programme on BBC World News, Africa Business Report. Komla travelled across Africa, meeting Africa's top entrepreneurs and reporting on the latest business trends around the continent. He interviewed a number of high-profile guests including Bill Gates and Kofi Annan. He anchored live coverage of major events including the 2010 World Cup in South Africa, the funeral of Kim Jong Il, the release of Israeli soldier Gilad Shalit, the Norway shootings and the wedding of Prince William and Kate Middleton. In 2013 Komla featured in New African magazine’s list of the 100 most influential Africans.